Climbing up ladders to work at height comes with its risks, so ensuring an appropriate ladder is used is highly important. 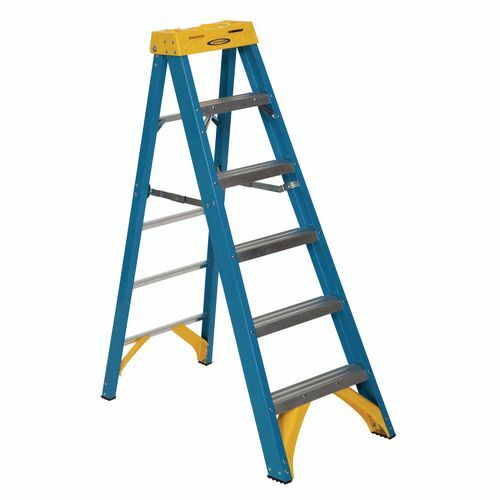 Our glass fibre steps for industrial use are strong and reliable ladders to help keep the user supported and safe while they are working. They have specially designed moulded brace and foot pad to enhance bracing strength and damage protection. There are extra knee braces on the front of the frames for increased rigidity and they have horizontal back leg strengthening bars. Heavy duty internal spreaders protect the steps from accidental damage and the slip resistant traction tread steps help to prevent the user from slipping. Another feature helping to protect the user is that the stiles are non-conductive to 30,000 volts and the steps conform to EN131 for professional and domestic use. Our glass fibre steps for industrial use are durable and secure steps; they are available in 5 sizes; 4 treads, 6 treads, 8 treads, 10 treads or 12 treads. They come with a 12 month guarantee and FREE UK Delivery.